On January 26, the fifth edition of the Antwerp Diamond Trade Fair (ADTF) will open its doors to the many hundreds of invited international jewellery manufacturers, retailers and designers. For three days, they will visit the trading halls of the Antwerp Diamond Bourse, the Diamond Club of Antwerp and the Antwerp Diamond Kring, to trade and network with close to 90 Antwerp’s leading diamond firms. "We all feel that with this edition of the Fair, we are presenting the full potential of Antwerp’s diamond industry and trade," said Marcel Pruwer, president of the Antwerp Diamond Bourse (Beurs voor Diamanthandel), Antwerp’s largest diamond exchange. "Five years after its inception, the ADTF with its breathtaking array of diamonds, is living proof of Antwerp’s leading position as the world’s preferred diamond supplier to the downstream markets worldwide," Pruwer added. 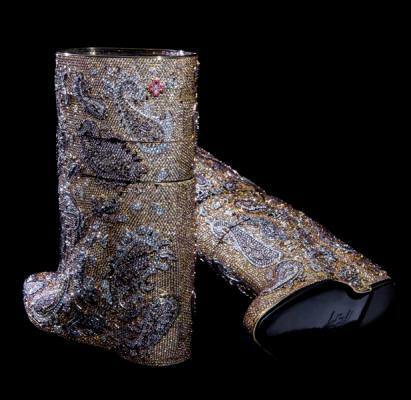 These ’Diamond Boots,’ display a paisley pattern completely covered in 1,550 carats of natural fancy colored champagne, grey and pink diamonds from Diarough/UNI-Design. A team of highly skilled craftsmen set all 39,083 diamonds on the boots. One of the visual highlights of the fair will be the exhibit of the "Diamond Boots," designed and shaped by the internationally respected, Belgian designer duo A.F.Vandevorst, and executed by Diarough, a leading Antwerp diamond firm. The boots were unveiled last December in Hong Kong during a ceremony attended by her Royal Highness, Mathilde, the Queen of Belgium; the Minister-President of the Government of Flanders, Kris Peeters; and Vice-Prime Minister and Minister of Foreign Affairs, Didier Reynders. The diamond boots will be on display for the first time in Europe during the "Antwerp Diamond Night" on January 26. 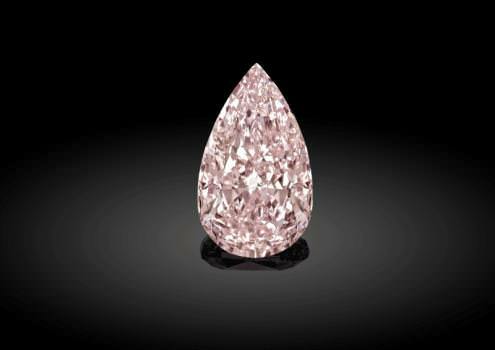 A type IIa, 15-carat, fancy pink, VVS1, pear shape diamond, courtesy Antwerp Cut Co.
During the fair, two breakfast seminars are scheduled. On January 27, Chicago diamond marketing pundit Aleah Arundale-Siegel, will speak on Marketing diamonds and diamond jewellery to retailers. At the second breakfast seminar, on January 28, Ernest Blom, president of the World Federation of Diamond Bourses (WFDB), will present the initiative undertaken by the World Diamond Mark Foundation (WDMF) to create and implement a global, generic diamond marketing and promotion campaign. The Antwerp Diamond Bourse, Diamond Club of Antwerp and the Antwerp Diamond Kring are happy that the Antwerp Diamond Trade Fair is powered by the AWDC.